Space Coast Beach Buzz: Lights Out for Sea Turtles! Sea turtle nesting season started officially yesterday, although Florida's nesting season starts early (whenever the turtles feel like it) - we've already talked about a daytime nesting leatherback (April 20 post). Unfortunately, sea turtle strandings occur year-around. Sea Turtle Preservation Society (STPS) friend Ann writes of three last week, two in the Indian River Lagoon by Jorgenson's Landing near Grant. Ann referred to them as "floaters" - no obvious injuries, but full of gas because of a clogged intestinal system. 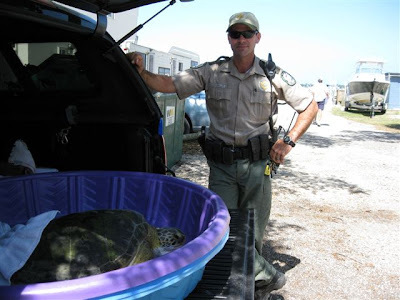 The two green sea turtles were discovered bobbing up and down and unable to dive by Patrick Corley, a Florida Fish and Wildlife Conservation Commission (FWC) officer, who got them into his boat and then called the STPS. The turtles (one named Corley, of course :) were transported to the Marine Science Center (MSC) in Ponce Inlet for treatment. That's Officer Corely and his namesake in the photo. The third turtle was an very large adult male loggerhead off Satellite Beach that had been struck by a boat, and he could not be saved. As Ann notes, Brevard County has about 50% of the loggerhead nests for the state. This time of year, there is a lot of loggerhead mating in the near-shore waters of the Atlantic. During mating season, the turtles come in closer to the shore and that makes them more vulnerable to being hit by a boat. The message is, boaters (in the ocean or in the lagoon) be aware, especially during the late spring and summer months. Another stranding last week, unusual for Brevard County, was a Hawksbill sea turtle - we seldom see them here. Friend Margie, beach coordinator for the City of Cocoa Beach and also an STPS volunteer, discovered him. STPS volunteers transferred this little guy to MSC, where he was named Nutmeg. MSC employee, friend, and Conservation Hero Tammy sent us these photos of Nutmeg, who weighed in at 524 grams (1 pound, 2.48 oz). She also sent photos of some success stories - we'll show those in the next turtle post. So ... lights out for sea turtles, May 1 through October 31. You can help prevent disorientation of nesting female and hatchling sea turtles by turning off or shielding indoor and outdoor lighting visible from the beach after dark. Thanks to Ann and Tammy for their photos, and as always, our admiration and appreciation to them and the rest of the folks who work so diligently to protect our critters. Lots of false crawls on the Indian Harbour Beach last night. Also saw lots of Dog Tracks. I've passed your comment along to the Sea Turtle Preservation Society folks - thanks.